Remove and discard unpopped kernels from popped popcorn. 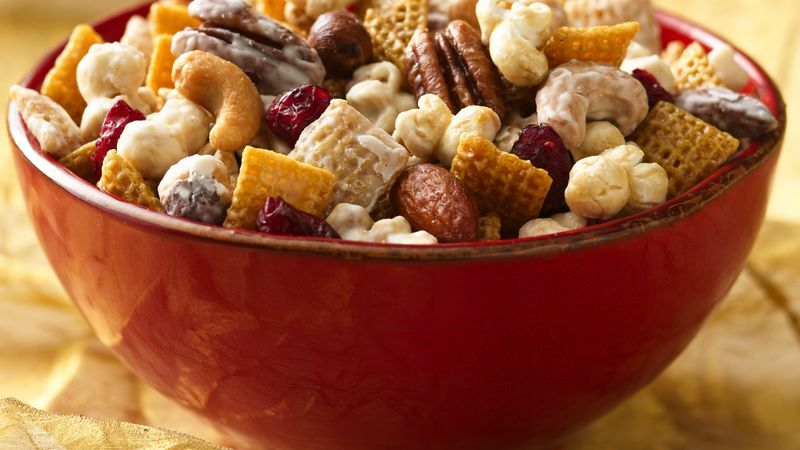 In large microwavable bowl, mix popcorn, cereal and nuts; set aside. In 2-cup microwavable measuring cup, microwave butter, brown sugar and corn syrup uncovered on High about 1 minute 30 seconds, stirring after 1 minute, until mixture is boiling. Pour over cereal mixture, stirring until evenly coated. Microwave uncovered on High about 5 minutes, stirring and scraping bowl after every minute, until cereal just begins to turn brown. Spread on waxed paper or foil to cool, about 15 minutes, stirring occasionally to break up. In medium microwavable bowl, microwave baking chips uncovered on High 1 minute to 1 minute 30 seconds, stirring every 30 seconds, until melted and smooth. Add 3 cups of the cooled cereal mixture to melted chips; toss gently until evenly coated. Spread on waxed paper or foil. Cool about 30 minutes or until set. In serving bowl, mix both cereal mixtures and cranberries. Store in airtight container. Look for holiday-decorated cellophane bags in craft or paper goods stores. Fill with this extra-special mix and tie with festive ribbons for a welcome holiday gift. Oven Directions: Heat oven to 250°F. Remove and discard unpopped kernels from popped popcorn. In ungreased large roasting pan, mix popcorn, cereal and nuts; set aside. In 1 1/2-quart saucepan, heat butter, brown sugar and corn syrup to boiling over medium heat, stirring frequently. Pour over cereal mixture, stirring until evenly coated. Bake 1 hour, stirring every 15 minutes. Spread on waxed paper or foil to cool, about 15 minutes, stirring occasionally to break up. In 1-quart saucepan, heat baking chips over low heat, stirring frequently, until melted and smooth. Add 3 cups of the cooled cereal mixture to melted chips; toss gently until evenly coated. Spread on waxed paper or foil. Cool about 30 minutes or until set. In serving bowl, mix both cereal mixtures and cranberries. Store in airtight container.